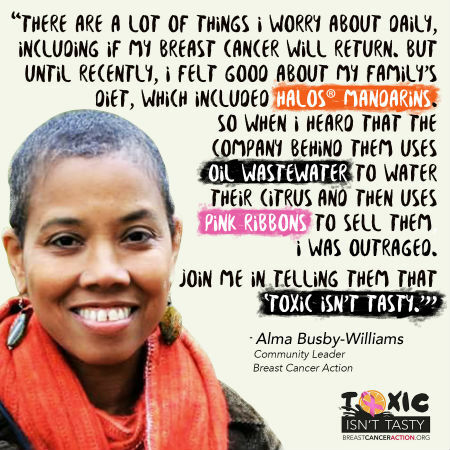 There are only 5 days left in Pinktober to tell Bee Sweet Citrus and Wonderful Citrus that “Toxic Isn’t Tasty.” Thousands of people have been calling on these citrus companies to stop pinkwashing and stop using oil wastewater to irrigate their citrus. You can read Alma’s full story here, and then join her in taking action TODAY! Already took action? Get 5 friends to join you—one for each day left in the month. Together, we’re flooding the inboxes of these companies’ presidents so they hear us loud and clear: we want them to put women’s health before corporate profit!